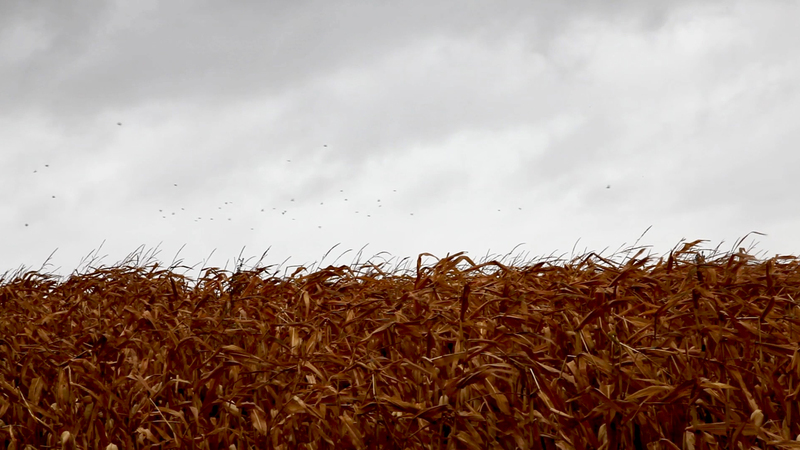 An unknown field of maize is shot in a single take during Cyclone Lusi’s procession across New Zealand in March 2014. The field is ripe for harvest and teeming with the myriad sounds of insect and bird life. Dark storm clouds loom overhead, pushed along by the blustery wind whose gusts distorts the microphone. Beyond the frame, the sound of cars traversing the rain soaked road, and the high pitched hum of a plane’s manoeuvres at a nearby airport, punctuate this otherwise country scene. As a kind of pseudo-amateur recording – whose sound is poor and whose horizon is not level with the frame – it may give the possible impression of someone anticipating something. Perhaps an anomaly which may be about to appear, or reappear. A scene loaded with expectation. And yet nothing happens, save for a flock of birds flying up from the crop and out of the frame. The recording is looped at this point, complicating its documentary status and revealing it as a kind of fabrication.